Continuing with the report from Finland that started here yesterday . . .
Well, Game 6 went to double OT. Vantaa won 2-1, scoring with three seconds left in the second OT. The TuTo goalie got a major for "abuse of officials" plus a double game misconduct, one for "throwing a stick or object" and the second for "abuse of officials" at the end of the game. The winning goal was a power-play goal, so that may account for the "abuse of officials,” etc. . . . Vantaa wins the series 4-2 and plays SaPKo Savonlinna in the final. D Mark Rubinchik of the Saskatoon is on the roster of the team that will represent Russia at the IIHF U-18 World Championship in Poprad and Spisska Nova Ves, Slovakia, next week. Rubinchik played for Russia at the Ivan Hlinka Memorial last summer. With the Blades, he had 23 assists in 63 games. . . . The Blades also will be represented as equipment manager Chad Scharff has been named to that role with Team Canada. . . . Russia opens the IIHF tournament against Sweden on April 13. F Jansen Harkins of the Prince George Cougars has signed a three-year entry-level contract with the Winnipeg Jets, who selected him in the second round of the 2015 NHL draft. Harkins has joined the Manitoba Moose, the Jets’ AHL affiliate, and will spend the remainder of the season there. Harkins put up 242 points, including 75 goals, in 275 regular-season games over four seasons with the Cougars. He is Prince George’s all-time leader in assists (167) and points. F Reid Duke of the Brandon Wheat Kings has signed a PTO with the AHL’s Chicago Wolves and will finish this season with them. Earlier, Duke, 21, signed an NHL contract with the expansion Vegas Golden Knights, who apparently are working on a deal to purchase an AHL franchise but haven’t yet announced it. This season, Duke had 71 points, 37 of them goals, in 59 games with the Wheat Kings. MORE ON THE MOVE: D Ondrej Vala of the Kamloops Blazers has joined the Texas Stars, the AHL affiliate of the NHL’s Dallas Stars. Vala just completed his second WHL season. Vala, who will turn 19 on April 13, signed a three-year entry-level deal with Dallas in September. From Slovakia, he wasn’t selected in the NHL draft. . . . F Matt Phillips of the Victoria Royals will finish the season with the AHL’s Stockton Heat, which is affiliated with the NHL’s Calgary Flames. The Flames selected him in the sixth round of the NHL’s 2016 draft. . . . F Michael Spacek of the Red Deer Rebels has signed an ATO with the AHL’s Manitoba Moose. The parent Winnipeg Jets selected him in the fourth round of the NHL’s 2015 draft. He has yet to sign an NHL contract. Barzal had "no comment" regarding the rumors circulating while he was out. game in a month as the Seattle Thunderbirds beat the Silvertips, 3-2. . . . Game 2 is scheduled for tonight in Everett. . . . Barzal, the Western Conference’s most outstanding player, last played on March 7. Originally, he was thought to have been out with the mumps, but the Thunderbirds never did release the results of his tests and it all turned into speculation that he had mononucleosis. . . . Barzal opened the scoring on a PP, at 2:07 of the second period, getting his own rebound and beating G Carter Hart. . . . Everett tied it on F Eetu Tuulola’s third goal, at 17:53. . . . Seattle went ahead 2-1 when F Tyler Adams (1) scored at 5:31 of the third period. . . . That set the stage for something of a wild finish. . . . With G Carter Hart on the bench for an extra attacker, Everett D Aaron Irving scored on a point shot through traffic at 18:22. . . . 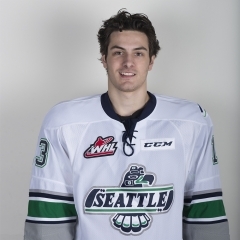 The Thunderbirds broke the tie 39 seconds later as F Donovan Neuls (4) scored on the rebound of a Barzal shot. . . . Seattle got two assists from F Alexander True, with Neuls adding one to his goal. . . . G Carl Stankowski ran his playoff record to 5-0 with 21 saves, nine fewer than Hart. . . . Seattle was 1-2 on the PP; Everett was 0-2. . . . Barzal now has played in 34 WHL playoff games. He has put up 42 points, including 11 goals. . . . Seattle remained without F Ryan Gropp and G Rylan Toth. Gropp was injured in Game 2 of a first-round series with the Tri-City Americans. Toth hasn’t played since March 11. . . . Everett F Devon Skoleski played for the first time since March 19. . . . Announced attendance: 4,588. Winterhawks. . . . They’ll play Game 2 in Kelowna tonight. . . . Kelowna F Calvin Thurkauf (1) opened the scoring at 3:42 of the second period. . . . F Kole Lind (2) made it 2-0 at 4:32, and F Reid Gardiner’s sixth goal upped that to 3-0 at 5:17. . . . 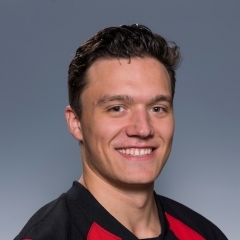 The Rockets completed a four-goal second-period as F Dillon Dube (5) scored on a PP, at 16:08. . . . Portland got on the scoreboard when F Brad Ginnell (2) scored at 10:50 of the third period. . . . F Cody Glass (3) scored Portland’s second goal, on a PP with G Cole Kehler on the bench for an extra attacker, at 17:34. . . . Portland received another PP after that one and came close to scoring, with F Skyler McKenzie being stoned by G Michael Herringer and F Joachim Blichfeld hitting a post. . . . Thurkauf also had two assists, for a three-point outing, with Gardiner and Lind adding an assist each. . . . Herringer finished with 27 saves, while Kehler blocked 50 shots. . . . The Rockets had a 43-12 edge in shots — and that 4-0 lead — after two periods. . . . Kelowna was 1-4 on the PP; Portland was 1-5. . . . The Rockets’ penalty killers have allowed two goals in 37 opportunities in seven playoff games. . . . Announced attendance: 5,002. 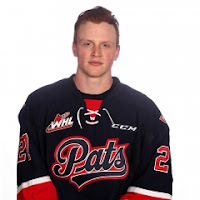 At Regina, the Pats scored the game’s last five goals as they beat the Swift Current Broncos, 6-2. . . . The series is tied, 1-1, with Game 3 set for Monday in Swift Current. It will be televised by Sportsnet. . . . The Broncos had won the opener, 1-0 in OT, on Thursday night in Regina. . . . In Game 1, the Pats received only one PP opportunity. In Game 2, Regina was 2-10 with the man advantage and the Broncos, who were 2-5, know they can’t win by taking that many trips to the penalty box. . . . D Jonathan Smart (1) gave Regina a 1-0 lead at 9:36 of the first period. . . . The Broncos went ahead 2-1 on first-period PP goals from D Max Lajoie (1), at 12:35, and F Tyler Steenbergen (7), at 16:18. . . . The Pats tied it 43 seconds into the second period as D Connor Hobbs (2) counted on a PP. . . . The home team went ahead at 6:08 as F Nick Henry (2) also scored on the PP. . . . F Austin Wagner (5) added insurance at 14:28. . . . Regina F Robbie Holmes (1) and Wagner (6), into an empty net, added third-period goals. . . . Regina got two assists from F Sam Steel, with Henry and Hobbs adding one each. . . . F Aleksi Heponiemi had two assists for the Broncos, with Steenbergen getting one. . . . G Tyler Brown stopped 15 shots for the Pats, while the Broncos’ Jordan Papirny turned aside 34. . . . Regina F Adam Brooks, who totalled 250 points in 139 regular-season games over the last two seasons, left in the first period with an apparent left knee injury. He got bumped a couple of times in the neutral zone, went down and was slow leaving the ice. He came on the ice a few minutes later, test it and left for the dressing room. . . . The Pats scratched F Filip Ahl, but it isn't known if he was ill or injured. . . . Announced attendance: 6,484. Pats won't disclose the nature of Adam Brooks injury, or a timeline for his return. I did see him walking around, good sign. beat the Lethbridge Hurricanes, 4-0. . . . They’ll play Game 2 in Medicine Hat tonight. . . . Shaw TV is covering this series in its entirety. . . . The Tigers have played five games in these playoffs, and won all of them. Bullion is 5-0, 1.80, .926. . . . F Steve Owre scored a goal, his second of the playoffs, and added two assists. . . . 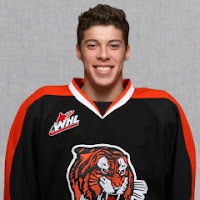 The Tigers went up 1-0 when F John Dahlstrom scored at 15:23 of the first period. . . . Medicine Hat took control with second-period goals from F Chad Butcher (2), at 5:42, and Owre, at 17:25. . . . F Zach Fischer (4) got the game’s last goal, at 15:01 of the third period. . . . Fischer and Butcher each had one assist, too. . . . Lethbridge took the game’s only four minor penalties. . . . Medicine Hat was 0-0 on the PP. . . . The Hurricanes got 33 saves from G Stuart Skinner. . . . D Brad Forrest remains out of the Tigers’ lineup with an undisclosed injury. . . . Announced attendance: 4,580.